Love, like everything else, is a light-hearted game to the Aquarius man. He will approach relationships playfully, unleashing his flirty charm in small, calculated doses. You won't often hear an Aquarius man say "I love you," at least not in the traditional way or at the appropriate moment. His nonconformist nature will not let him express himself in the usual, conventional way. Flowers, chocolates, dinner and a movie – such normal dating gestures are anathema to him. Instead, be prepared for cloud writing in the sky, surprise trips to a tea picking Indian village, and a cancer research centre named in your honor. He's that kind of man. He loves deeply and sincerely, and would give his life for his other half in an instant. He just doesn't really buy into all the Hallmark sentimentality. While the more retiring types of Aquarians may not be as grandiose in their gift giving, their gifts will always be unconventional and totally unique in some way. Ruled by Air, the way to the cerebral Aquarian's libido is through his mind. Excite, enchant, and enthrall him with little mind games and wait for the inferno of passion between the sheets that will come later. Experimental and audacious, the more outgoing of Aquarius men are often the first to suggest joining the mile high club, or dare you to skinny dip with them on a moonlit night. Nothing is too provocative or challenging to him in the bedroom, or more often, out of it. The quieter types will nevertheless surprise you at every turn, once you've earned their trust. It can be difficult to get close to these types of Aquarian men, but once you do, you'll be glad you persisted. 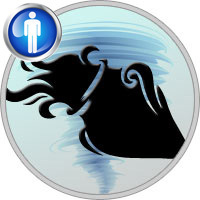 A will-o-wisp of a lover, it can be difficult to pin an Aquarius man down to commitment, but once he's found the right woman, he is quite happy to give up being blown where the wind takes him, and settle down. The Aquarius man is attracted to intelligence, so his partner has to be someone who understands his grand designs for life and humanity. He must be assured that his treasured independence isn't under threat; or else he will disappear like a gust of wind. If he is already committed, he is not one to break free quickly, but signs of his discontent will be everywhere. Absolute reciprocal freedom works best for a partnership with an Aquarius man, which is not to say that every Aquarian seeks an open relationship. The Water Bearer simply wants his own space and freedom of movement, and is quite happy to share a life together with a smart, self-reliant partner who supports his need for autonomy. He is generally considered most compatible with Libra, Gemini, Sagittarius, and Aries. See also Sun sign compatibility. However, there is a lot more to compatibility than only the comparison of the Sun signs. For example, how do your Venus signs compare? Find out Venus signs here. Discover Venus sign compatibility here. If there's anybody who can look into the future and know he can make things better, then an Aquarius man is the one. This gentleman is interesting to be around and that's evident by his large circle of friends. As unemotional and logical as the Aquarius man appears to be, he is also an optimist and a romantic – and this unlikely combination of traits makes him a valued friend and a dedicated partner. Driven by logic, yet highly unpredictable, the Aquarius man can rationalize all options and then make a choice you'd least expect. When it comes to money, the Aquarius man rules his pocketbook by logic and not emotion. This makes him a smart investor, a sound negotiator, and an extremely difficult person to fool in matters of business. Although he maintains a stable financial portfolio, an innovative nature allows him to take the occasional well planned risk. Hand the Aquarius man a contract to sign and be assured that he’ll read the fine print before putting pen to paper. Fashionable in a dark blue suit, the Aquarius man is ready to dominate the boardroom. Playfully dressed in an electric blue polo shirt and tan khakis, this man ardently whisks his partner away to a casual lunch, or a leisurely stroll along the city boardwalk. When this gentleman wears jewelry, it is chic, practical, and kept to a minimum. The Aquarius man will check out the latest in men's fashion, but dresses to please himself, not those around him. A genuinely nice person, the Aquarius man has many friends or acquaintances, but only a small circle of really close ones. Although he's a self-assured and outgoing individual, he does have a tendency to emotionally distance himself from those around him, and this makes the Aquarius man an unpredictable and confusing companion at times. Despite what may appear to be negative traits for a sound relationship, the Aquarius man is a loyal individual who highly values a true friendship. To the Aquarius man, a strong mental attraction shares an equal with or greater importance than any physical appeal. Characteristically unemotional, or at least not obviously so, this man needs communication to be intimate in his relationships, but don't count him out as an arduous lover. He is an Aquarius – unpredictable and innovative – so you can expect the bedroom antics to be full of new and exciting pleasures. Enjoying long talks, moon-lit walks, and holding hands, the Aquarius gentleman is a romantic who's ready to give unconditional love to the right partner. Generally healthy and usually active, the Aquarius man is known to have problems with his legs, however. Enjoying energetic participation in sports may be good, but he has to exercise with caution. Perhaps an activity that stimulates the mind may be more appropriate for this man than a hard game of football. True to his personality, the Aquarius man will flirt with injury to engage in any team sport that provides camaraderie. If the Aquarius man can keep his contradictory nature in check and be flexible with employees, he would make a good leader. With his intelligence and logical outlook, occupations in mechanics, photography, engineering, education and broadcasting are well suited for him. Leaning towards the humanities and ready to tackle the world, this man could easily find himself doing battle in the political arena. With his positive outlook on life and a true commitment towards humanity, it's not unrealistic to have an Aquarius man step up to the plate and be recognized as a world leader.